A view from the top of the 49-story Cira Centre South tower in University City. The boundaries of Center City are usually confined by two bodies of water. But AKA University City at Cira Centre South is trying to break that barrier and bring Philly’s “sixth square” to life in University City. 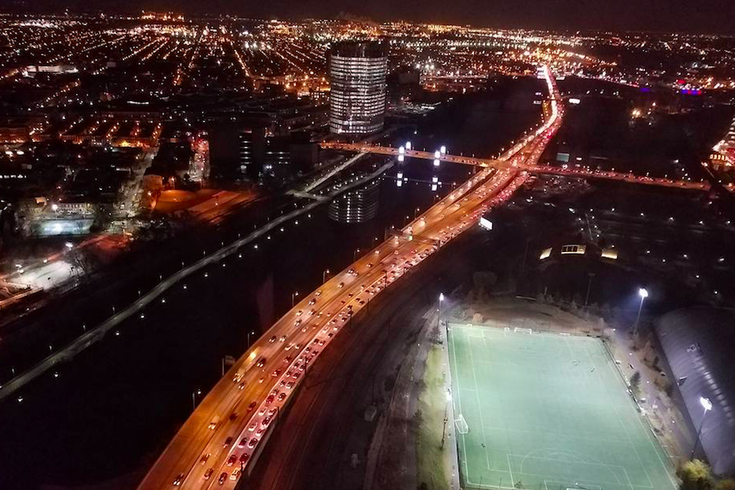 What Brandywine Realty Trust is trying to create would be a fully functional, vertical, urban neighborhood overlooking Center City and the Schuylkill Expressway, with convenient access to and from the airport. This January will mark the final stages of the development of Brandywine Realty Trust’s groundbreaking 49-story Cira Centre South tower, which will feature a collection of 268 luxury hotel and apartment residences by AKA, situated on the top 18 floors of the 862,000 square-ft. tower. “City Hall is Philly's fifth square, but I think University City ought to be part of Center City – as the sixth square – given two of the world's finest hospitals (CHOP and the University of Pennsylvania), two of the best universities (Penn and Drexel), the innovative work, live and play spaces of the Cira Center, and, of course, the city's critical 30th Street Station,” said Larry Korman, president of AKA hotel residences. AKA will offer a gamut of residential living options from hotel residences, serviced residences and furnished residences to apartment residences including penthouse versions of each, with options of one day – to one-year leases – that come furnished, accessorized or as an apartment. All 268 residences begin 400 feet above ground, making them the tallest residences in the city – and certainly with some impressive views. AKA will also operate Level 28, a similar concept to New York City’s SoHo houses, only with more amenities. They’ll feature a multi-dimensional wellness center with a 72-foot stainless steel pool, locker facility, a fitness center, a Lissoni Associati-designed lounge, a conference room, a dining area and a terrace throughout the floor, along with a two-tier, state-of-the-art cinema and an indoor, virtual golf course. Perhaps the most exciting part for Philly foodies is that AKA will also help oversee Philadelphia’s first Michelin star-rated restaurant and bar by the New York operators of Rebelle and Pearl & Ash. The restaurant will offer breakfast, lunch, dinner and bar service to the building’s residents and tenants and everyone in the neighborhood. “We saw tremendous value in bringing a contemporary restaurant concept to Cira Centre South that would provide residents and travelers access to a dining experience unlike any other in Philadelphia,” said Evan O’Donnell, Managing Director of AKA University City. AKA will also work with Brandywine to program Cira Green for musical, movie, fashion, and other private and public events. “Cira Green has become a highly desirable part of the University City neighborhood. Located 90-feet above street level, the one-acre, elevated park provides respite from the bustling city streets and offers some of the best panoramic views of the city,” said Clayre Cardi, Owner of Kaleidoscope Solutions, the event-management company that runs the events that take place on Cira Green. AKA already operates five properties in New York City as well as three properties in Philly (Rittenhouse Square and Washington Square), Washington, D.C., Beverly Hills and London.